Back in January, an event occurred, which the author has been privileged in attending now for the sixth year in a row. The event consists of a single day of practical hands on experiences for media and then four days of talking to an ungodly number of individuals whom are representative of the entire world for Shooting, Hunting and Outdoor manufacturers, distributors and retailers. Of course this equates to the 2012 SHOT Show which is the largest venue of its kind anywhere in the world. This is Colt's masterful foray into reproduction firearms, the 1877 Colt Gatling Gun which was the star of Media in TPF's opinion. The Monday, January 16th, the temperature outdoors was quite decent and the sky was cloud-free which made Media Day, once again a fine day to go and play with some of the newest firearms and related products which are currently or soon to be available for the commercial markets. Optics, ammunition, handguns, rifles, shotguns, stocks, and a host of other items were available to over 1200 media individuals to experience first hand the products available. Some items truly stood out for the author and the number one item memorable experience was cranking the handle of Colt’s reproduction 1877 Gatling Gun. 20 rounds of 45/70 Government, flew by and seemed effortless as you turned the handle of this beautiful reproduction of history. High quality prototype 308 Winchester chambered bull-pup rifles, custom machined .50 BMG projectiles, the Slide Fire stock, are just a couple of the items that were experienced by the huge crowd of media types. For the next four days the actual trade show ensued once again at the Sands Convention center. Over 1600 companies were there with in excess of 36,000 people coming to interact with them brought the total attendees to more than 61,000 people over four days. Stunning, especially when you consider that representatives from all 50 states were there as well as representation from more than 100 countries. TPF will not go into the thousands of products that were displayed and showcased as there are multitudes of other websites and writers whom dwell on the little nuances. 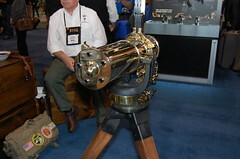 There were however an extreme multitude of famous and mentionable people in attendance or in some cases, on display at SHOT Show 2012. As usual the legends and successful masters of shooting disciplines were present, as well as TV sensations both past and present. 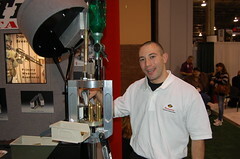 Lou Ferrigno, was seen repeatedly examining various products as a guest of Barrett Firearms; as well, several participants of the TV Show Top Shot Season 4 were discovering the huge industry on display at SHOT Show 2012. Further highlights of celebrity fanfare was the feature appearances by the crew of Red Jacket Firearms from the TV show, Sons of Guns, and many others. 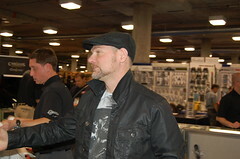 Famous Canadian survivalist, Les Stroud (Survivorman) was in attendance and yes there was a lineup to met him. TPF isn’t going to go into the huge details about what was present and what new products were available for the US market. Suffice to say that the author would be able to write a short novella of several tens of thousands of words showing the various new non-firearm products, let alone new guns. We will however keep you, the reader, abreast of any products which these manufacturers, distributors, and retailers, graciously provide to TPF-Online for review. 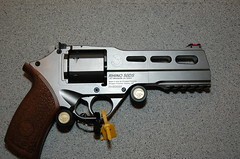 Firearm designs like the Chiappa Rhino are being featured in future reviews by TPF-Online. So Stay tuned! Much of the excitement and great moments at the SHOT Show is when the author met so many other Canadians on happenstance, Mrs. Page from Packing Pink, Mr. Krete from The Gun Centre, Mr. Hansen from Freedom Ventures, Mr. Muir from Lever Arms, Mr. Ruston from Tactical Products Canada, and a host of others representing Canadian businesses. Many thanks are to be given to these individuals and companies for attending and creating the contracts and arrangements which continue to supply our Canada market with firearms and related products. If you are ever able to go, TPF-Online recommends that you do so and experience the multi-billion dollar industry which is partially displayed at SHOT Show. And recall that this is just a PARTIAL display as there are many many other businesses and manufacturers who are not in attendance. A great example is FWB, or Feinwerkbau, one of the oldest and most renowned Olympic class firearms makers, wasn’t present yet again in this year’s SHOT Show. 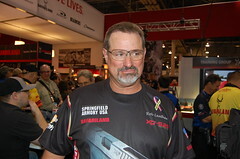 Top Shot, Season 4 competitor, Mr. Frank Miller was experiencing the scope of the firearms industry for the first time. This moment Mr. Mellor was admiring Ten-X's .50BMG progressive press. One of the most respected and well known action shooters, Mr. Rob Leatham, aka The Great One, is one of the best ambassadors that the shooting community has ever had. This years SHOT Show was executed even better than last year and once again, anyone coming should bring a couple pairs of walking shoes to explore and experience the whole event and all booths. However, be forewarned that should you attend, plan your visits to the booths they would have roughly a minute for visiting each booth, and when you consider the sheer scale of the show, much of that time can be walking from booth to booth. There are many displays and extra events which can eat up several minutes of time, such as watching professional shooters show their skills, lining up to get autographs and pictures with celebrities, as well as hands on experience with the multitudes of firearms accessories and outdoor gear. 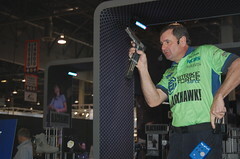 Veteran shooter Todd Jarrett shows off his skills in a display at the Blackhawk booth. Such displays are common and very well attended by to those wanting to learn and see the skill levels of the masters. The 2012 Shooting, Hunting, Outdoor Trade Show is the largest event of it’s type in the world and TPF can guarantee that should you ever attend this event, every single product displayed at the show will be Practical, Tactical, or Fantasical. A small example of how you can spend your time talking to one of the many representatives of companies in attendance. Presenting Angus Hobdell, who has been shooting CZ products since 1986 and a member of Team CZ-USA since 2003. In 2012, he is still a great competitor and 100% behind promoting CZ-USA. On behalf of TPF-Online and the CSSA, many thanks Mr. Hobdell for your time and efforts. As an added bonus, over the next few days and weeks, TPF will be releasing small video clips from many of the top action shooters in regards to the shooting sports and tips for improving your abilities. So stay tuned! This entry was posted on March 8, 2012 by M. Duynhoven. It was filed under Ammunition, Blades and tools, CSSA, Firearms accessories, Gear that you wear! Dress for the occasion!, General Shooting, Holsters, sheaths & pouches, Optics & target acquisition, Ranting & Raving, Reloading equipment & supplies and was tagged with Action Shooting, CSSA, firearms, guns, las vegas, Shot Show, Shot Show 2012, TPF, TPF-Online, trade show.